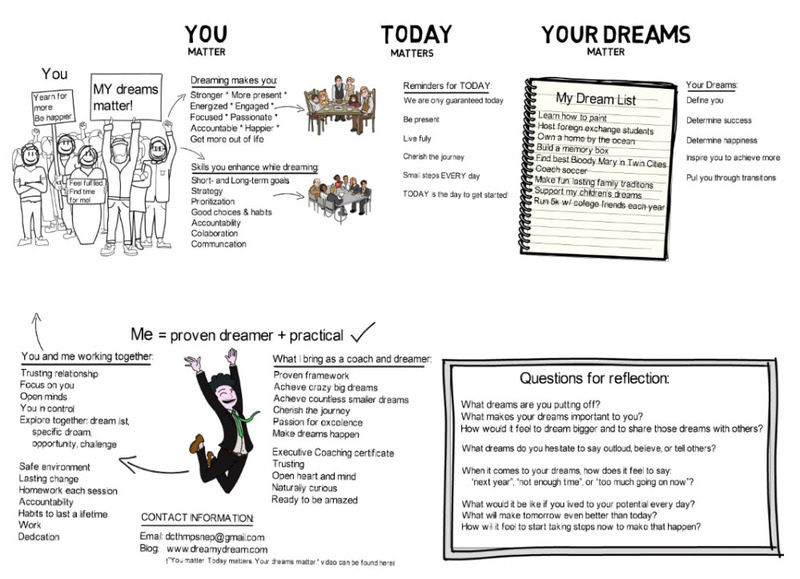 Executive Coaching | Dream Big – Make a Difference! As part of my mission to help others and make a bigger difference in this world all the time, I earned my Executive Coaching certificate at the University of St. Thomas in 2016. Watch these videos to see why “You Matter. Today Matters. 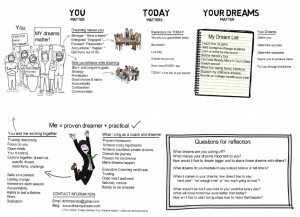 And Your Dreams Matter“, and to find out what coaching and dreaming would be like with me. If you have interest in being a client (or understanding more about what coaching is) send me an email (dcthmpsnep@gmail.com) and we’ll talk about whether this is a good fit for both of us. It is approximately a 1-hour monthly commitment, for 3 – 6 months. The price is right (donations of your choosing to my 2018 Chicago Marathon fundraising or to a charity of your choice). If you work for Pearson contact me via work email (sorry, I’m currently not able to “coach” anyone in my department or on my floor, but we can talk about dreams or mentoring) – no charge at all within Pearson.